Please direct questions to our Camp Directors at campdirector@elliscenter.org. Get ready to s.t.e.a.m. into summer this 2019! Campers will grow self-confidence, make new friends, and most importantly—have fun! Camp ImpAACt 2018 had a record number of twenty campers! Interested in sponsoring Camp ImpAACt? Please Email Christie at Csmith@elliscenter.org for information. 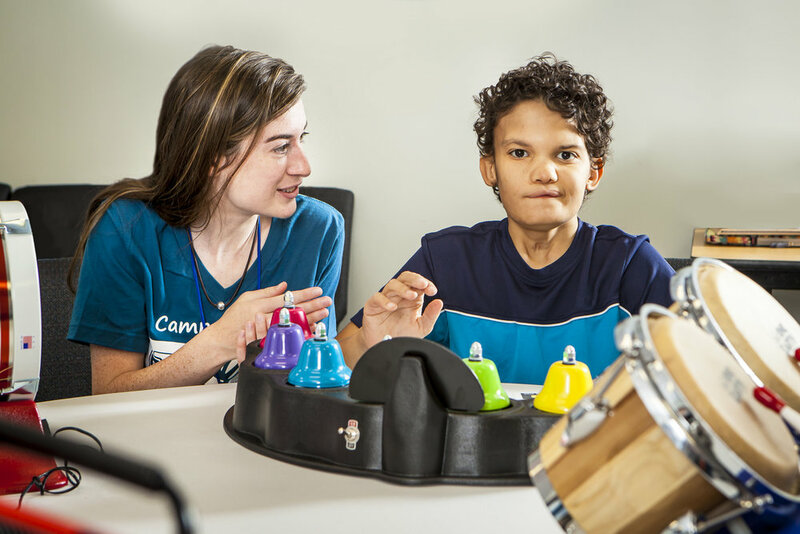 Camp ImpAACt volunteers can provide administrative support, group or activity assistance or can be paired with a camper as a one-on-one counselor. Please email Cristina at Charty@elliscenter.org to apply. "I volunteered with the Ellis School this summer as a one-on-one counselor and I was so impressed by their focus on developing the communication skills of every student, regardless of their ability. I saw tangible improvement in so many of the kids in just a week." Volunteers are essential to making this a memorable and incredible week! Every type of skill, ability, and talent is needed. We need help both inside and outside of camp week. Those interested in working directly with a camper for the entire week as a one-on-one, please complete this form. One-on-ones must have complete availability for the entire week and we recommend having some background working with children with disabilities. Those who would like to be a general volunteer, should complete this form. General volunteers are not required to be at camp the entire week. Duties include a variety of tasks such as: providing extra support in groups, breaking down and setting up activities, preparing snacks, and any other tasks assigned by group leaders. Direct any questions and requests more information by contacting Cristina Harty at Charty@elliscenter.org.